Please go to the Public Calendar page for the archery shoot schedule. 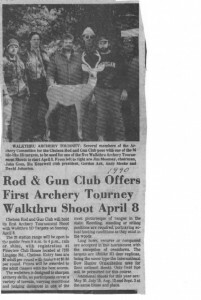 The Chelsea Rod & Gun Archery program began in February of 1989 when Stu Kenewell, Jim Moomey and Dave (Butch) Johnston were able to convince the membership to spend an enormous amount of money on 28 Makenzie 3D targets and set up a 3D Archery Course over the 65 acres of club property. A committee was formed With Stu and Jim as chairmen and we never looked back. 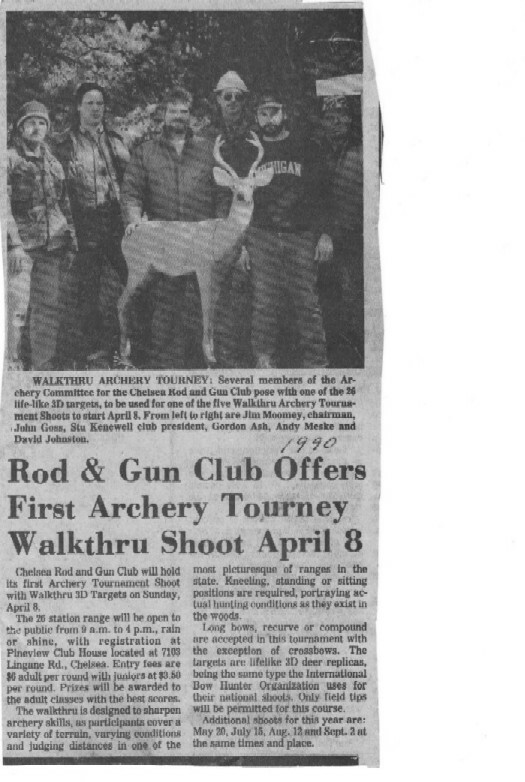 The first Shoot was held in March of that year with over 250 shooters in attendance. The committee grew to more than 20 active members and monthly shoots have been held ever since. The Archery course has changed and expanded over the years and is considered to be one of the finest in the State. Registration opens by 8:00 a.m. and closes at 2:00 p.m. on the day of the shoot. WHITE stakes have a 25 yard maximum range. YELLOW stakes have a 35 yard maximum range. RED stakes have a 40 yard maximum range. GREEN stakes have a 45 yard maximum range. BLUE stakes have a 50 yard maximum range. The first scorecard is the official score and only this first scorecard shall be registered. Second round shooting and scorecard may be purchased for $5.00 after the first round scorecard is turned in at the registration stand. However, second round shooting must begin before registration closes at 2:00. The second round score is not registered. Registration fee can be reimbursed, but only for equipment failures. The target course generally consists of thirty 3-D wildlife targets at varying shooting distances. No rangefinders are allowed on the range during shoot events. A course map is posted in the clubhouse for viewing. Once you begin shooting, you must finish the course or take an incomplete. No wandering, keep your group together. This is a safety issue and it also distracts other shooters. Allow groups to “shoot through” if you have groups backed up behind you and openings ahead. Shooters unable to complete the course or do not turn in a scorecard are registered with an INCOMPLETE round. To qualify for any award, a shooter must be registered, have an official scorecard, record his/her score on that card, and scores must be turned in after shooting. Awards are presented to the three highest scores in each class and category. Awards may be claimed up to 90 days following the shoot. Protests must be made to the registration stand while the shoot is still in progress. The decision of the shoot committee is final.